Do you ever feel like all you do is clean but never get anywhere? Do you want to now the secrets on how to keep your home clean and tidy? Are you looking for ways to keep your home maintained and tidy so you feel comfortable and not overwhelmed by your space? It is no secret here that I used to be a bit of a slob. A drop your pants, and coffee cup and paperwork where ever is closest. A consume way too much so I had way too much and no where to put it all kinda mom. Well I am so glad to say this is no longer me! My home is tidy, organized and ready for company even with a toddler tornado coming through and messing stuff up hourly. I will share with you the three top tips that help me to keep on top of my home so I am not overwhelmed. This is not one of the tips but the first thing you need to do is just get rid of stuff. Go all Marie Kondo on your home and only keep things that spark joy. I promise you this. You will be happier, more connected to the Lord and less overwhelmed with less stuff. It kind of gets addicting as you go, the feelings of freedom you will feel as you lighten your load will only want you to donate or sell more. One of my biggest mottos here is to simplify your life (and stuff) in order to free up time and energy for things that really matter. 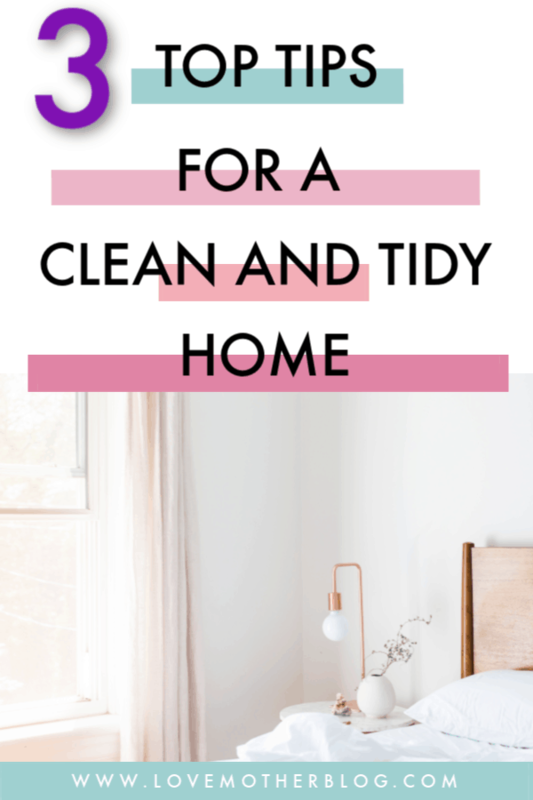 I am working on some more content to teach you just how to do it but in the mean time start using the best 3 tips for a tidy home. Have an “other place” basket in your main living areas. “Other Place” basket – For us this looks like 2 baskets, one in our living room and one in our downstairs family room. Anything that does not belong in these two rooms can get thrown into the basket. At the end of the night, either myself or the kids will take the basket and go from room to room and put away the items. This saves time from walking around in the middle of the day and putting things in the appropriate spot. Two full hands – Never walk by something without picking it up or moving it if it belongs in the room you are going to. Whenever I move throughout my house I always just fill my hands with things that belong other places. Not to go out of my way but for example if there is a cup beside the bed in the morning, instead of leaving it there as soon as I leave my bedroom my next stop is the kitchen to make coffee so I will bring the cup with me and put it in the dishwasher. Everything has a spot and label it – This may take some time but I find the more things are labeled with a designated spot the easier it is to keep things where they belong. Sure you may know where you prefer the cups or the pasta but if you have other people who help you with the housework you may find things end up in the wrong spot, which leads to things getting messy and cluttered real fast. When things are labeled it is easy for everyone in the family to know where things belong. So there you have it my 3 top tips on how to keep your home clean and tidy! What are the best tips you have for keeping a tidy home? Cleaning Schedule for the Not so Tidy Stay at Home Mom.